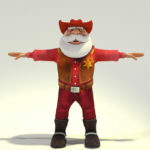 Previously available only as a part of a bundle, this Christmas themed character presents Santa in his wild west disguise. Is he time traveling again? 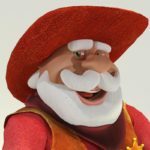 Toon Santa is a re-imagining of Santa as a Wild West sheriff, complete with hat, vest and a shining golden star. He wears spurs, but he never uses them. He just likes the way they jingle. 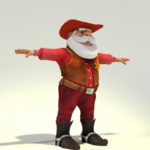 This is the standalone version of this model without the other releases of Toon Santa. It still requires you to install Chunk 3D. This character has also been referred to as Toon Santa 14. 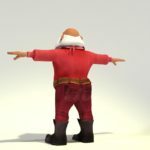 Toon Santa ™ for Chunk™ is the incredible Santa Claus character for use with Poser 8 or higher and DAZ Studio 4.5 or higher. 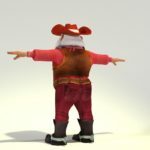 Because Toon Santa is based on Chunk, all clothing is revised and removable, so you can switch and swap props and clothing easily. Plus, you benefit from all the advances of the most recent Chunk, available for free from toonpeople.com. Cowboy Hat. Textured and Santa white & red. Wild West Neckerchief. Wipes of sweat when you need it. Western Boots & Spurs. Spurs are optional and removable. Leather Belt. Got to hold up his breeches. Leather Vest. Lovely textured leather. Wild West Santa’s Sheriff’s Star. All golden, with a nice message! 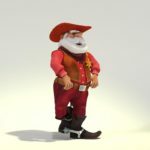 Toon Santa ™ is the lovable 3D Santa Claus created in love and respect for holiday traditions. If you grew up in the 70’s in North America, you probably spent some quality hours in December watching the Rankin/Bass stop motion classics such as the Christmas Television Favorites Santa Claus is Coming to Town, Rudolph the Red Nosed Reindeer, and a Year without a Santa Claus (and a selection of more religious programming). Toon Santa was designed to capture the pure and simple joy of that early holiday programming. Toon Santa was originally designed in 2002. Newly rendered images in Poser 11 using SuperFly renderer. Love your work so very much! !